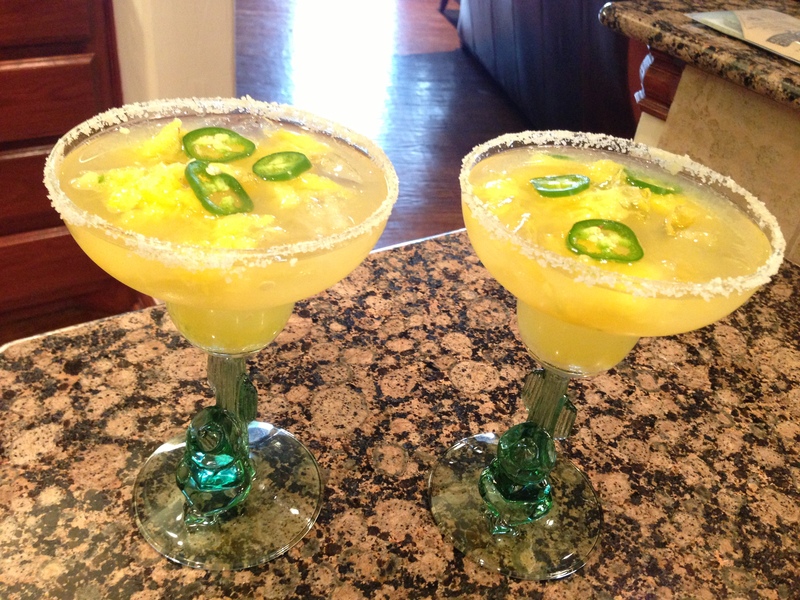 April in Plano…Pineapple Margarita anyone?? Pineapple-Jalapeño Margaritas…served in my favorite glasses. If I had a sombrero and a couple of these, I’d be sleeping, too! April in Plano…not quite as nostalgic as April in Paris. Yesterday, I came upon the most beautiful pineapples – fresh, organic, and wonderfully sweet! It was the aroma that first alerted me to their presence. Following my nose I soon found the sizable display around the corner. Pineapple after pineapple, piled one upon the other…a treasure trove just waiting for me to find ‘The Chosen One’. I will opt for the golden flesh of a perfectly ripe, juicy, sweet pineapple over 24K gold any day. Yes, I am that much of a food geek! I instantly knew what I would create with my treasure. My mind flashed back to last year at this time when I first bought my Vitamix. Pineapples were abundant then as well. Experimenting with the myriad ways I could use it, I discovered how well it purees even the toughest of fruits and vegetables. I cut up my golden beauty and placed her glorious chunks into my Vitamix, added lime juice, tequila, Grand Marnier and ice…and with but a few pulses – voila! – my Pineapple Margarita was born!! A waiting margarita glass – with salted rim, of course – was soon filled, leaving just enough room for a fresh pineapple garnish. Mmmm…. Yesterday’s margarita was similar, only upon rummaging in my liquor cabinet I discovered a lack of the ‘cheap’ tequila I reserve for margaritas (how did I let that happen? )…so I pulled out the ‘good stuff’ – which happens to be a bottle of Manik Anejo 100% Agave. I proceeded to chop my pineapple and squeeze the limes and carefully [ahem] measure my tequila and Grand Marnier. My favorite margarita glass – you know, the one with the man sleeping under his sombrero at the base of the glass – was prepared and waiting for this special ‘nectar of the gods’ I was creating. A few passes in the Vitamix was all it took and my glass was soon full.